Leighton Baines and Ross Barkley both played as England made it five straight wins in their Euro 2016 qualifying campaign with a routine victory over Lithuania. Baines started at left-back and completed the full 90 minutes, while Barkley replaced Jordan Henderson with 19 minutes left. Phil Jagielka was an unused substitute. Former Blue Wayne Rooney had already hit a post when he opened the scoring after just six minutes. Danny Welbeck made it two seconds before half-time and after the break, goals from Raheem Sterling and debutant Harry Kane completed a comfortable night’s work for the Three Lions. They now travel to Italy for a friendly on Tuesday night. Meanwhile, over in the Czech Republic, England Under-21s faced the hosts of this summer’s European Under-21 Championships in friendly action. Both Luke Garbutt and John Stones made cameos off the bench, the former at the start of the second half and the latter coming on after 70 minutes. And both helped the young Lions to a 1-0 victory after midfielder Tom Carroll fired in the only goal of the game just seconds after the restart. Roy Hodgson is likely to hand Ross Barkley the chance to further impress for England against Italy. The Three Lions face a tricky friendly encounter with the Italians on Tuesday evening. And after an impressive 20 minute cameo in England’s 4-0 win over Lithuania on Friday, Barkley is in line to start in Turin. 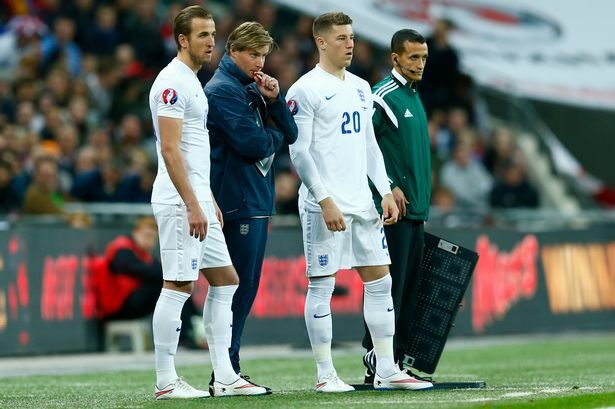 "I was particularly pleased with Ross Barkley," said Hodgson. "He’s not always had the praise this year that he thought he might get, but you couldn’t fault his performance. "A lot of players will be getting their opportunity against Italy. "If we are going to test our players out, you’ll see them given a bigger test against Italy than a team like Lithuania can give us. "We will be playing with players we wouldn’t normally rely upon. There are an awful lot of people in the squad I count on that we’ve lost. "But what it means is for those who are still with us, many who are relatively untried, there will be a chance for them to show that my faith in selecting them for this squad was justified." England’s Under-21 squad, which includes Luke Garbutt and John Stones, take on Germany at Middlesbrough’s Riverside Stadium on Monday evening. Wayne Rooney called Ross Barkley over last week and repeated some wise words he heard from Ole Gunnar Solskjaer in a bid to improve the Everton midfielder's stuttering form. "He and Everton hit the heights last season," said the England captain. "But he hasn't done as well ,as the team haven't recently. "But I spoke to him after the game on Friday and the only advice I gave him was to watch the game from the bench with England. "He will know how to get into the opposition, where the spaces are. "That's what Ole Gunnar Solskjaer said to me when I was young, so you know where to be when you come on. If it helps, then great." Barkley did come on for the last 20 minutes against Lithuania to win his tenth cap, but the man who came on alongside him snatched all the headlines - Spurs striker Harry Kane. But Barkley is expected to feature again in the international friendly in Turin against italy. England manager Roy Hodgson raised eyebrows when he criticised Barkley after a friendly match against Ecuador in Florida last summer. Instead of praising the player, he said he "lost the ball an awful lot" and when pressed on his performance again, Hodgson snapped: "I am not prepared to address your obsession with Ross Barkley." But Hodgson said this week he was trying to protect the player, rather than knock him down a peg or two. Hodgson said: "I wasn't trying to criticise him. I was trying to dampen the enthusiasm that we had suddenly found a player with great quality, and the comparisons with (Paul) Gascoigne and (Bryan) Robson." Hodgson's argument is undermined somewhat by the fact that he compared Barkley to Gascoigne last November. Still, he says he is a big fan of the Blues midfielder. "The fact we selected him shows we believe in him," Hodgson said. "That's a boost." Ross Barkley was the subject of praise from the England manager and captain following an impressive second-half display against Italy on Tuesday evening. The Everton midfielder, 21, was introduced after 55 minutes of play in Turin and aided the Three Lions to a 1-1 draw, after the Azzuri had taken a lead in the first period. After the game, Roy Hodgson singled out the Blues' academy graduate and goalscorer Andros Townsend for helping to change the game after the break. “Obviously there were a lot of changes tonight and at the end of the game even more changes,” said the England boss. “We basically had a whole team that didn’t play here tonight but the great thing was the ones who came on – and I’m thinking particularly of Ross Barkley and Andros Townsend – they did brilliantly well. “There wouldn’t have been many positives to take out of the game had we played the second half like we did in the first and drifted to a defeat in a pretty sort of stale encounter." Skipper Rooney was also asked about Barkley's bright cameo and the former Toffee tipped the youngster to take confidence from another international appearance. The striker said: “Ross is a terrific young player and I think he can have an impact when he comes on and he did that. He took the ball, he ran at the Italian defenders and made it difficult for them. Everton midfielder Barkley described as "fantastic"
Roy Hodgson has described Ross Barkley’s second-half England cameo as “fantastic”. The Three Lions boss introduced the 21-year-old Everton midfielder against Italy with 35 minutes remaining in Turin last night. And Barkley produced a really bright display as Hodgson's men fought back to grab a draw in the friendly. “He was fantastic,” said Hodgson. “Both he and (goalscorer Andros) Townsend turned the game. “I thought Barkley in particular was really, really good. Meanwhile, England goalkeeper Joe Hart was also full of admiration for the Blues midfielder. Speaking after the game, the Manchester City shot-stopper said: "Ross played with no fear and we need to encourage that in England. "We need to back people like Ross Barkley." Barkley won his 12th international cap last night against Italy. Townsend, who struck his third international goal, said: “I have just been desperate to get on the pitch and silence a few critics.